As a mechanical engineer, I am always looking to educate myself on the engineering aspects of cars. I have probably read dozens of textbooks over the years regarding automotive subjects and probably thousands of magazines. My favorite magazines currently are Autoweek, Grassroots Motorsports, and Classic Motorsports. I skim through Hot Rod just to marvel at the lengths some guys go to to create custom cars. I’ve pretty much sworn off the mainstream publications such as Motor Trend and Road and Track as I am really not in the mode of continuously chasing after the latest new car offerings. 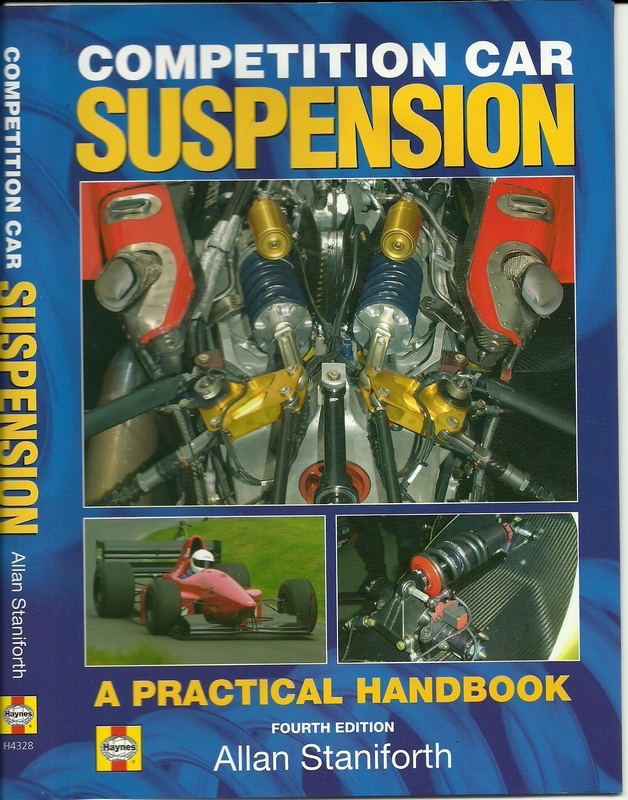 I have read a number of books about suspension design. Most are educational and tend to spend a lot of time explaining all the different suspension design concepts available but don’t contain much actual advice about going faster. I would say that after reading these books I have a pretty good general understanding about the various suspension design concepts. There are 2 books that I have read recently that come much closer to teaching me concepts that can actually be put to use on my track car. They are Competition Car Suspension by Allan Staniforth and The Racing and High Performance Tire by Paul Haney. So in a perfect world, as your car went through a corner, all 4 tires would contribute their maximum available cornering force and you would corner like you were “on rails”. Unfortunately it doesn’t work like this. Haney and Staniforth both do a pretty good job of explaining load transfer and how this affects the ultimate grip level in a corner. Even the most non-technical racer understands the outside tires in a corner are doing a lot of work and the inside tires – not so much. In some cases you get the dramatic photo of a car with an inside tire lifted clear off the ground. Dramatic stuff but once that tire lifts off the ground it is doing zilch. Which leads to Staniforths book, which I think does a better job than any that I have read of describing methods of maximizing the grip level of all 4 tires but in particular the front and rear tire on the outside of a corner. Of course with unlimited money and limited rules, one can come up with Formula 1 or Can-Am cars that really do an outstanding job of getting the most out of a set of tires. In my case, I am trying to keep my car faithful to the Spec 944 rules put forth by NASA (and pretty much endorsed chapter and verse by PCA). In the interest of low cost racing, a lot of the features of the Porsche 944 that could be fiddled with to make the car go faster are fixed to a spec standard. There is a minimum weight of 2600 pounds including the driver. The maximum track width is fixed. A single standard spec tire is required. Currently the Toyo Proxes RA-1. Soon to be the Toyo RR. A 225-50/15 size is also mandated. A spec shock is required. Stock suspension components are required to a great degree, which means a McPherson strut design in the front and trailing arms with torsion bars in the back. Suspension pickup or attachment points cannot be modified. Likewise for the steering assembly. Rear torsion bars are limited to a maximum diameter of 30 mm for solid bars. Interestingly front springs and front and rear sway bars are free choice but as we will see the stock suspension setup and a 30 mm rear bar put you in a little bit of a box. One of the most fascinating points that Staniforth works out, in great detail, is that the total weight transfer to the outside tires is NOT a function of spring or shock selection. I am not sure that most folks are aware of this, as there seems to be a lot of bench racing discussion about spring and shock packages. Less weight transfer is very valuable, as it lets the inside tires contribute more to the entire grip level of the 4 tires taken together. 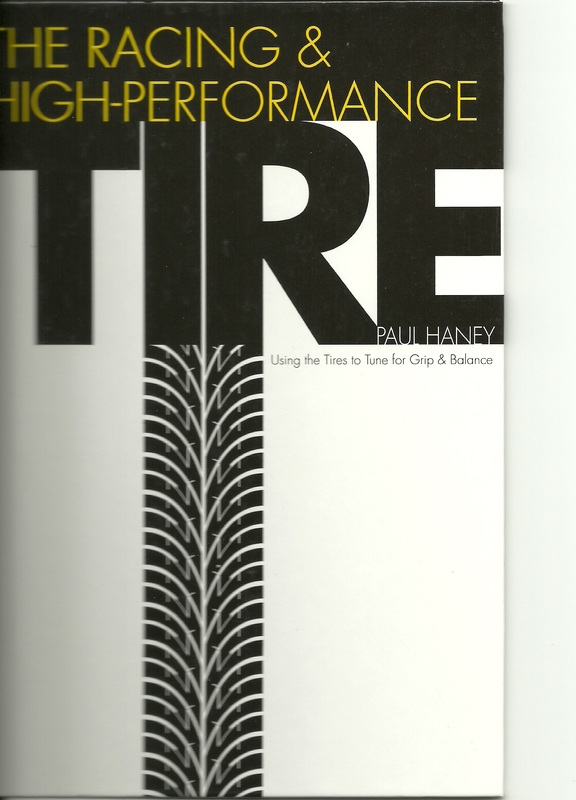 And without going into the details (Haney does that nicely) 2 outside tires loaded to 1300 pounds each (and 2 inside tires with zero load) will not develop as much grip as 4 tires loaded to 650 pounds each. And the worst case scenario is 1 outside tire loaded to 2600 pounds and the other 3 tires with zero load. Not physically possible unless you are about to flip over but the point is that the more the cornering load can be shared equally amongst the 4 tires the better. The Porsche 944 has one great advantage going for it right out of the box. That would be it’s almost 50:50 front to rear weight distribution. In this case it mimics mid-engine cars. It does so by placing the engine behind the front axle and moving the transmission to the rear axle i.e. the transaxle. In this case, there is much less chance of the front tires being overloaded during cornering (as with most front engine cars) or the rear tires being overloaded (as with the 911). But as we will see, this balance can be upset by haphazard spring and sway bar selection. This last year I ran on an almost stock suspension package. At this point, the driver is still the limiting factor in my overall lap times and no tire/suspension package was going to override my still developing skills! I ran 200# springs in the front versus 150# stock. These springs also lowered the front by 1″. I ran “turbo” front and rear sway bar that someone gave me. At the time, it just seemed like a good thing to do. I also lowered the rear of the car by 1″ by resetting the torsion bars. I ran Khumo Ecsta tires in a 225/50-15 size on Fuchs wheels. I put as much negative camber into the front tires that the stock “cam” bolts would allow, which is about -2 degrees. I have had several instructors tell me that they felt it was time to move up to better tire. So this winter I plan to invest in some suspension and tire upgrades. The tire part is easy. I’ll go with the 944 Spec tire. The suspension part was more of a challenge. Staniforth spends much time leading the reader to the conclusion that balance is the key. The goal is to make the front and the rear of the car place the cornering load onto the outside tires as equally as possible. In the case of the neutrally balanced 944 that means that the front and rear should have pretty much an equal stiffness. Let’s get some terminology straight. Springs have a “spring rate” which is expressed in force per unit of displacement. In the USA, that would be pounds per inch, although many folks leave off the inch part and just talk about pounds. (And my shorthand symbol for pounds is #). Ergo the 200# springs I am running will exert a 200 pound force when compressed 1 inch. There is also “wheel rate” which is the effective spring rate of the suspension package at the middle of the point of tire contact with the pavement. This is also expressed in pounds per inch and is the much more important value as far as balancing the cornering forces amongst the tires. But Staniforth goes one step further and gives the reader the tools to evaluate the front and rear “roll stiffness”. This is a more elegant value as it brings into play the combined effect of the springs and the sway bars. It’s units are inch pounds per degree. With this value, he is expressing how many degrees the car will rotate when exposed to a rotational moment load. If you were to attach a long board to the front bumper that stuck off to the side of the car and stood on the end of the board, the front of the car would rotate until the springs and sway bars loaded up. The bigger the number, the less rotation will occur. The bigger the numbers at the front and rear axle the less the car will rotate in the corners. I understand that a lot about folks want to have their cars corner as “flat” as possible. But my reading tells me that to a large degree, the rotation of the car in a corner is not necessarily a bad thing to be avoided. Thinking on this has evolved over the decades. In the 50’s some professional racers liked a car that heeled over in the corners as they thought it gave them a better “feel” for the car. I rode in an Alfa Romeo sedan when I was in high school that really alarmed me as it felt like it was going to tip over in the corners. My Porsche 356B convertible D was much better and cornered pretty flat. From my reading, 2 things have led to the much stiffer suspensions for modern race cars. The first occurred in the 60’s and 70’s as race tires got much wider in a short period of time. In order to keep the wider tires in uniform contact with the road in a corner, the suspension designers started to stiffen things up. But as I have demonstrated in my previous article about the camber curves of a 944 McPherson strut front suspension, the front suspension of the 944 and other cars has been designed to minimize this effect. What I think has really driven the move to very stiff suspensions is the aero package now on all high end race cars. The aero package works most reliably if the car body remains square to the road surface and at a fixed ride height. No roll desired. In this case, the car ultimately goes faster even with all the tires in the air, which most Formula One cars seem to be doing as they drive directly over the curbs in the tight corners! But for a 944, maintaining a consistent aero profile is not a deal breaker as the car has no aero to speak of! See Wind Tunnel Testing. But I bow to the experience of 944 Spec racers and decided to look into a stiffer suspension package. Not being exactly a follow the leader type of guy, I decided to do some analysis. Staniforth in Chapter 9 goes through a methodical approach of determining the front and rear roll stiffness of any car. It required that I obtain a bunch of parameters. The required parameters are: total front and rear (F/R) sprung weight, total F/R unsprung weight, height of the F/R roll center, F/R track width, F/R center of gravity height, F/R spring rates, F/R sway bar geometry, F/R suspension geometry. Many of these parameters can be directly measured. A few, like the roll center height are obtained graphically. The center of gravity height was a guesstimate. Staniforth gives all the pertinent equations, which I put into a spreadsheet so I could subsequently experiment with changes to parameters. A few interesting things jumped out at me. The spring and sway bar sizes have no effect on total load transfer to the outside wheels. But spring and sway bar sizes can be used to balance to the total load transfer equally between the front and rear outside tires. The front sway bar has a much greater effect on the front roll resistance than the springs. The rear torsion bar has a much greater effect on the rear roll resistance than the sway bar. I plugged all of these values into my spreadsheet. And you know what? In a simulated 1 g corner (I wish I could reach 1 g!) the total load transferred to the front outside tire is 1151 pounds and the total load transferred to the outside rear tire is 1144 pounds. A 7 pound difference! That is about as balanced as anyone could hope for. At least on paper. So I am thinking I am going to spring for this package (there’s a pun in there somewhere!) And the Toyo tires. Time, money, and energy permitting I hope to do a phased change over so I can evaluate the relative effect of the suspension package first and then the tires. The continuing challange is with me getting my brain to believe that I can really go faster, which is always the challenge for me. But we’ll see. Next year is shaping up to be a lot of fun. Long read but informative so worth it. I am thinking of buying and setting up a 944 for HPDE so this was very helpful.